How do you spend the first day of November? If you live near Mountain Grove, Missouri you may just spend an afternoon at Duane Garren’s 11th Annual Gospel Concert! This is the second year Duane brought in The McKameys from Clinton, Tennessee in addition to the group that always appears at this concert, Mountain Grove’s very own, The McCunes. It was a little different this year, driving by the high school, where, in previous years we would turn into and park near the gymnasium entrance. Instead, we continued on until we came to the brand new sports center, newly built and dedicated the day before. Yep, that means a Gospel concert was the very first event to be held in the center aside from the dedication ceremony! When we entered the building, though it was level with the ground outside, it was the second floor on the inside. After one look over the railing down into the center of the building where the stage was set up, I was in love. This new building was perfect for a concert! Later, down below, I found my seat as Duane led everyone in singing a few congregations and the National Anthem, with Kevin Beckett at the keyboard. The first group to come on stage was the McCunes, who started their set with Holy Ground, It’s a Wonderful Change and I’m Saved. “We are so excited to be here,” said Micki, Duane’s wife, “the Garren kids are coming up here…” She went on to say that folks asked her if the kids were going to sing that day, and as soon as they climbed the stage, they did! I’ve Never Been This Homesick Before was the tune that Andy, Alli and Macy sang. Alli was featured on the first verse and Macy on the second. When they finished, a combination of Teresa and Toni’s girls replaced them. “Here are the girls,” Micki announced, “we use to be called the girls, now we’re too old and so they’re the new girls!” LOL! They sang I Saw the Light and then Teresa and her daughters sang Home together. “We like some of the old songs,” said Teresa, teasing Duane about liking the next one because it was going to be a quartet song. The “quartet” song was On the Jericho Road. “We pulled out this song a few weeks ago,” said Micki of their next number, “and I think I learned this song when I was 13. But it’s still relevant for today.” That song was I Need You More Today Than I Did Yesterday. Afterwards, Feeling fine and If There’s No God followed. Teresa talked about what they were thankful for that Thanksgiving, and then they sang Had It Not Been and Wounded Soldier. “We have one last song for you today,” Micki announced. “We’re coming up to a holiday that is my absolute favorite, Thanksgiving. I like Christmas too, but I love the fellowship, the family and the food.” She went on to say that November 11th would be Veterans Day and how they would be remiss not to thank our Veterans.” So they asked all the Vets to stand and correlated how Mountain Grove let their first public event be a Gospel concert in a public school facility and how our Vets helped made that happen through their service. More Than a Name on a Wall was the song they sang to pay tribute to the Veterans and it wasn’t long before the crowd stood in ovation. Duane took the stage to introduce the McKameys and he mentioned how they were in Missouri last night too. “Last night we were in my home church in Purdy, Missouri,” Duane began, “and Rueben told me there were two places he always wanted to sing: one was Carnegie Hall and the other was Purdy, Missouri! Welcome The McKameys!” (It sounded like they had a time in Purdy!) I Sing a Song Everyday opened the McKamey’s set. “This is a great day the Lord has made,” said Peg, “and I will rejoice and be glad in it! I’m so thankful that He deemed Calvary a hill worth dying on.” Sheryl sang their song by that same name, A Hill Worth Dying On. The next one featured Reuben, An Old Sinner Like Me and went right into Some Morning I Shall Stand. “Sixty years, this year, have I known the Lord and I never got over it!” Peg exclaimed. Then they sang It Sure Looks Like Home to Me. “Amen,” Reuben announced, “Howdy everybody.” The crowd answered with their own howdy! “I know you can tell we’re from New York,” teased Reuben, “I doubt I’ll make it to Carnegie Hall, but I’ve made it to Purdy.” LOL! Group introductions were next and when Peg came to Reuben she bragged on his best traits. “He’s strong, and handsome and healthy!” she proclaimed. Rueben gave her a funny look then added, “You can tell the holidays are coming up.” LOL Peg asked Roger to sing Unspoken Request and so Connie, Sheryl and Eli accompanied him. “I want this male trio to sing this,” Peg said by way of introduction of the next tune, “Sometimes people who mean well say some harmful things – (then she gave an example), such as ‘We’re tired of hearing women sing! I want to hear some male singers!’” (To the audience Peg added…) “But don’t say a word about a male quartet!” LOL! So Roger, Eli and Reuben sang Finish Well – not to be confused with Karen Peck and New River’s song! *smile* Peg shared that Sheryl writes a lot of the songs they sing, including this one – There is Jesus. Towards the end, when the audience applauded they encored it. That ballad really brought a sweet spirit to the room! There was no better song to follow than God On the Mountain…and so it did! 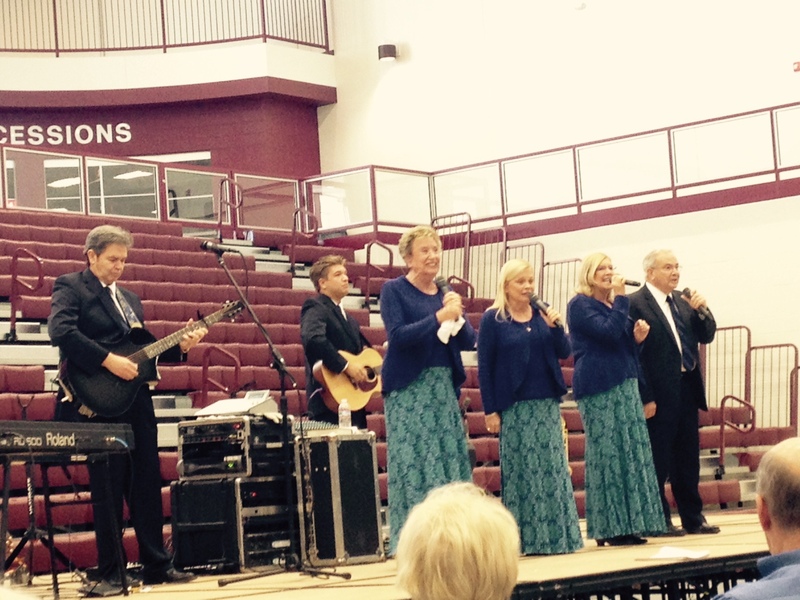 After, Peg extended a personal invitation to the McKameys Hometown Sing, June 12-13, 2015. Peg explained that a lot of folks ask if her sister, Carol, goes to their Hometown Sing. She teased, “We may have to hog tie her down but she will be there!” Reuben laughed, “See, I told you we weren’t from New York, they probably don’t know what hog tie is!” “Well,” Peg interjected, “when we go I’ll tell ‘em!” LOL The last song for the first set was a request, I’ve Made it By Grace. Peg’s shoes sailed across the stage on the second verse. An encore was in order and all the people were on their feet! Before intermission Duane took a moment to take up an offering. Micki and Teresa played Meeting in the Air on the Sax and Piano as an instrumental. When the second half was ready to begin, Duane asked the crowd, “Aren’t you glad they came back to Mountain Grove? Your friends the McKameys!” The ladies giggled as they took their mics and began singing because Reuben was still working the product table and couldn’t get away from the folks still buying CD’s. Their first song was, Who Do You Think? and before they started it, Peg teased, “That’s Roger’s favorite Christmas song…I’ll tell you about it after this one.” (Rogers face told another story.) Another Christmas song with the title of Joy To the World, yet not the traditional hymn, followed. “I was gonna tell you about Roger,” Peg began, “Because he don’t go to the product table.” Then she told the story of how one time, a lady came up to him and said, “I want that song that says Mary’s pregnant and what do you think about that?” The crowd giggled but Roger mouthed the words “Quit!” to the crowd. After, Peg said, “Wouldn’t it be something if you all would sing with the McKameys today? Then you tell everybody that you went down to the singing and sang with the McKameys and then so and so will ask me and I’ll say, ‘No, I’ve never sung with them.’” LOL Next she asked the crowd to sing Nothing But the Blood of Jesus with them. “I want Sheryl to come sing about the Shepherd tonight, the Good Shepherd, the Chief Shepherd,” Peg introduced. That song was The Shepherd’s Point of View. “I thank the Lord for my Shepherd,” said Reuben afterward, “I look at some of you that I know, and think of the valleys you’ve been through, and some of the things I walked through, but He’s never forsaken me; He brought me out to victory. We need to share it with other people – it takes nothing from me to tell you about it.” Then Eli sang his solo, I Want To Be That Man. “This is a good song that Reuben’s gonna sing for ya’,” said Peg, then he sang That’s How I Got Saved. After sharing some personal experiences from their lives, they went into their last full song, Do You Know How It Feels? (Encore!) “We’re about to part here,” said Peg, “but don’t forget that Jesus is with you no matter where you’re at.” Then they sang a reprise of There Is Jesus. Standing ovation. Conclusion: Duane’s concert in Mountain Grove is always a favorite of mine to go to! This concert would have been the 6th one I’ve been to in Mountain Grove. All of them hold great memories for me. This year was no exception, I love the new location! Another thing I love is how Duane hosts this concert in the afternoon so folks don’t have to stay out late on Saturday night but can still enjoy Gospel Music in the area. The McKameys did a great job!